Hey Blog Hoppers! It's Christy and Tammy from Fluttering Through First Grade. The first days of school are chock full of everything from backpacks to bathroom breaks. But, somewhere in between the controlled classroom chaos, it is imperative we find ways to build a classroom community. 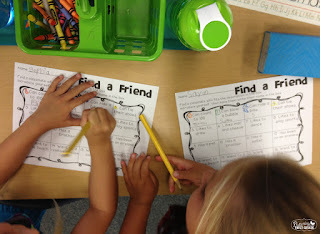 We want all of our students to feel comfortable in their own time, but we find providing our class with activities that allow them to get to know one another in the beginning of the school year are a must! But when it comes to our students, ice breakers in the classroom are the COOLEST! 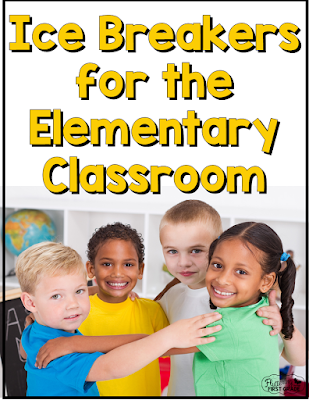 Here are a few of our favorite easy Ice Breakers for the Elementary Classroom. Stop and take some time to explain directions and take a few practice runs with the little ones on how to move around the circle before you actually play. The inner circle "cements their feet to the floor." 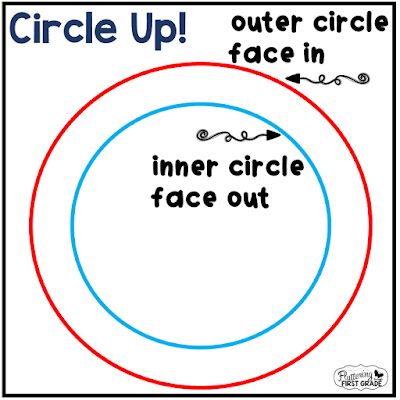 The outer circle, "Moves one click of the clock", which means one person. With our first graders, it takes about 3 practice moves and then they've got it! Once they move one person, they stop and chat. We give them get to know you topics like, "Tell each other what you like about school?" or "What is your most favorite dessert?". 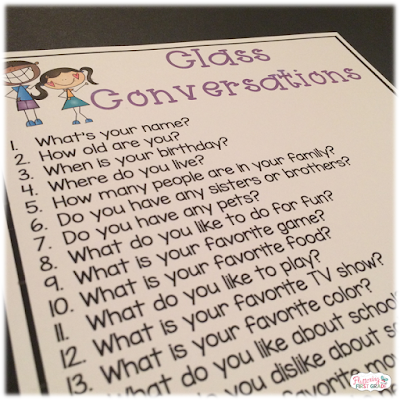 We also created this Class Conversations poster to help us think of ideas fast! You can download it for free here. Keep having students move around the circle as time allows. To keep things fair, we switch movers and foot cementers part way through. 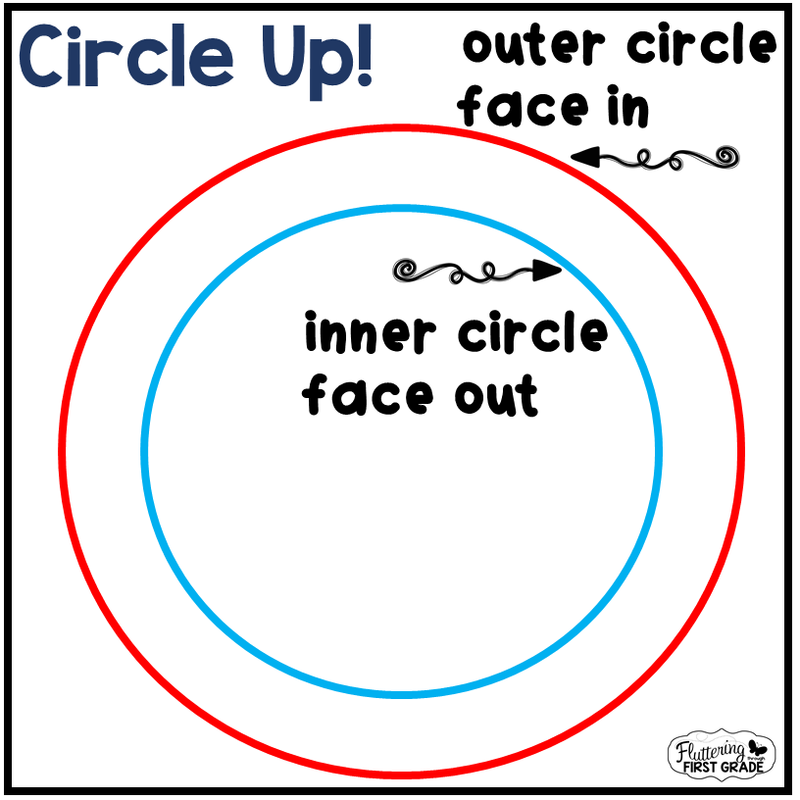 :) It's a quick and easy way to get your class chatting, so Circle Up! Name Swap ~ You'll need a class set of name cards for this one. We usually either write each student's name on a sentence strip or type them up. We keep the set handy all year. When the kids are at recess, drop another student's name on their desk, chair, floor spot or hand them out as they walk back in the door. 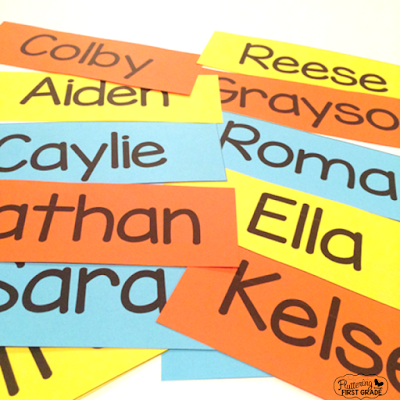 They will giggle because, "THIS is not their name, Teacher!" Tell them you messed up and ask them to help you by finding the rightful owner. Once they do, have them stop and talk for a few using the class conversations poster above. Back to Back ~ Put students in pairs and have them stand with the front person's back to their partner's front who should be behind them (like they are standing in line). Give the class questions that can be answered with numbers only. How many times have you been to the Zoo? The student standing behind writes their number on their partner's back with their finger. The partner turns around and tells them the number they think they wrote on their back. The writer confirms or clarifies and tells their partner a little more about their answer. 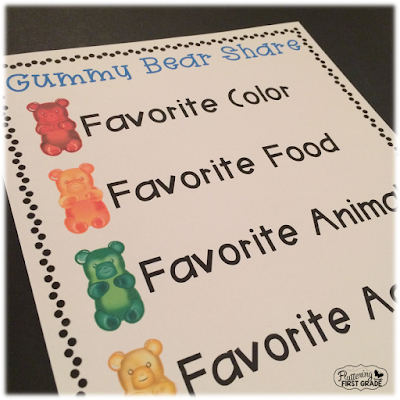 Gummy Bear Share ~ Grab a big bag of gummy bears (We used Haribo brand.) and give 1-5 to each student, depending upon time allowed and the age of your class. 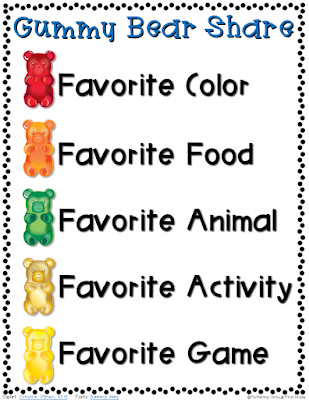 Assign each colored bear they choose a certain conversation topic or use our cheat sheet free Gummy Bear Share download here. Either sit whole class, partner up, or make small groups to share your gummy bears. Then of course the best part, gobble up the gummies! 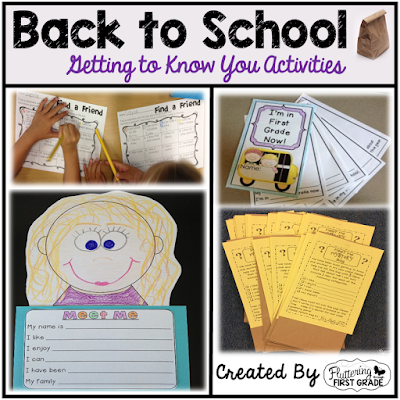 Meet Me ~ One of our favorite getting to know you activities are our Back to School Meet Me activities. They give our students more in depth opportunities to meet and greet their new class while practicing their listening, speaking, reading and writing skills. Find a Friend is always a hit. 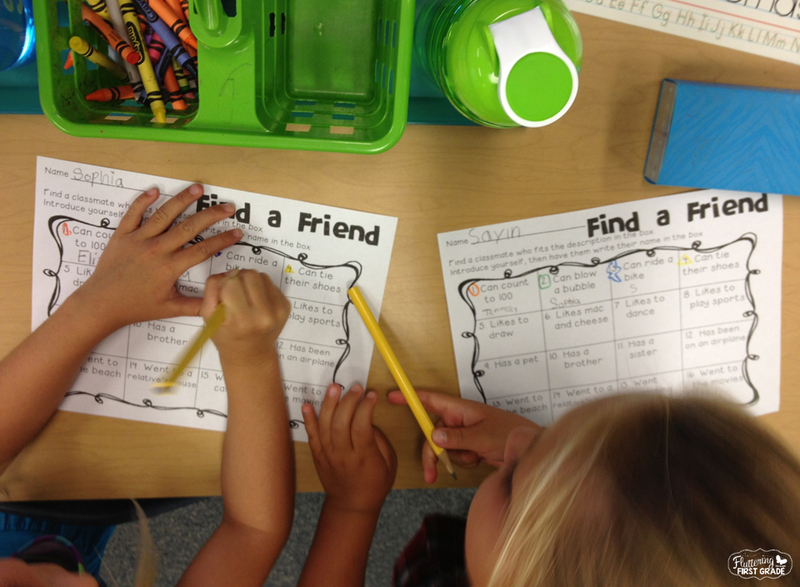 For our first graders, we have to break it down row by row and spread it out over a week's time. We do one row a day for five days. It's a perfect daily activity that they get the hang of quickly. Our first homework assignment helps us get to know our new class and allows our students to shine. 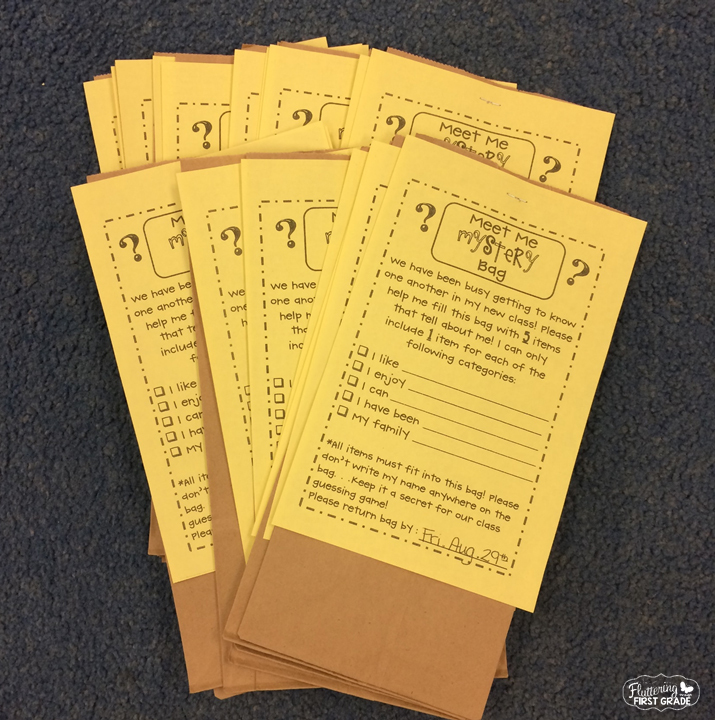 They each take home a Meet Me Mystery Bag on the first day of school to fill with specific items for sharing. We spend 5 days sharing a few bags a day and allowing students to get to know their new classmates. Then as a culminating activity, we write about our mystery bag items and create a class Meet Me bulletin board. You can take a closer peek at this back to school resource by clicking the image below. 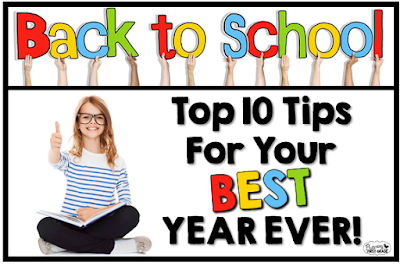 Top 10 Tips for Your Best Year Ever! 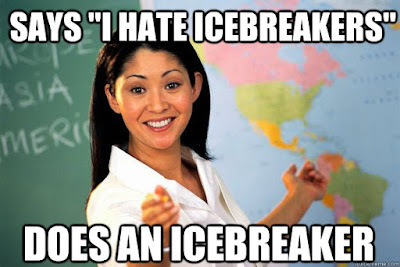 How do you help your students break the ice? We'd love to know!